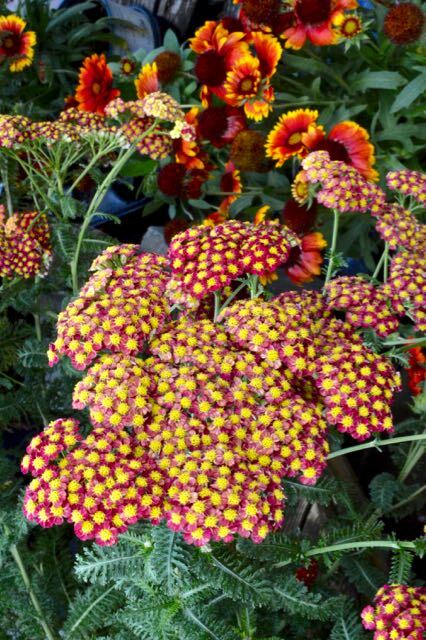 Yarrow or Achillea millefolium is a reliable but kinda plain-Jane flower that’s easy to take for granted. 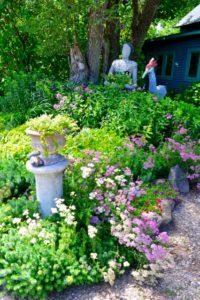 That is, until you notice it used skillfully – as I did in the garden of U.S. landscape designer Barbara Katz on the 2017 Garden Bloggers Fling. 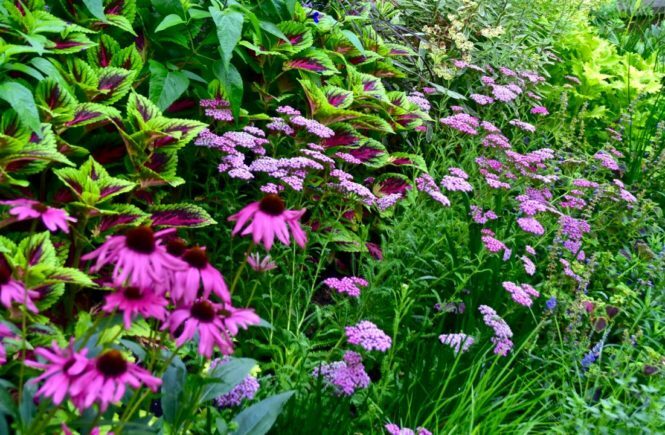 Wow, I thought, looking at the vignette above, Great colour echo between the Echinacea and coleus. Has that happened to you? Like when I was pregnant, suddenly noticing aaaaaaa-ll those other pregnant women. Since visiting Katz’s garden, as I archive old garden pics or walk around looking at plants, it’s suddenly, Oh. There’s yarrow! This is a tough little plant. Long blooming and drought resistant, it probably deserves to be noticed more often. We might dismiss the white, weedy, wild yarrow (there’s disagreement whether or not it’s native to North America; some say yes. Wandering Botanist Kathleen Keeler has an interesting article here). The cultivated kind now comes in more and more colours. Yes, it can sprawl and get greedy for space. But, gee, it makes a nice filler. And pollinators love it. I turned up many “taken for granted” yarrow pictures in my archive including ones from VanDusen Botanical Garden in Vancouver (bottom left) and from Westwind Farm on the 2014 Portland Fling (bottom right). All attention went to the glorious reds in both gardens. But the pink and white yarrows clearly add to each picture. 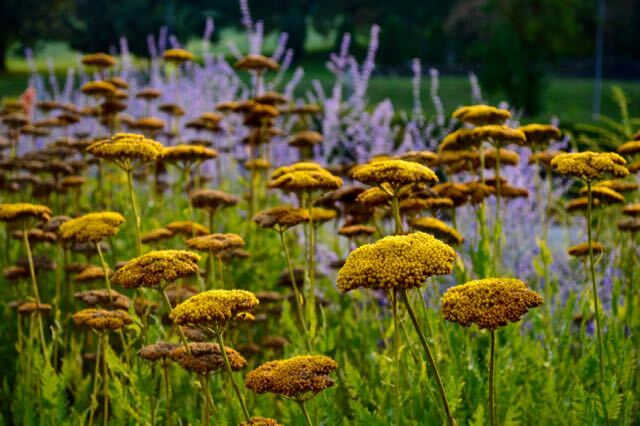 Yarrow at the VanDusen Botanical Garden. White yarrow at Westwind Farm near Portland. Finally, an excuse to show this from Westwind Farm. 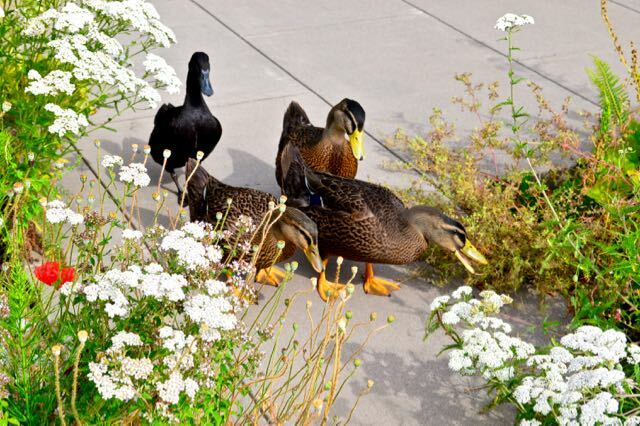 Is yarrow everything it’s… um, quacked up to be? 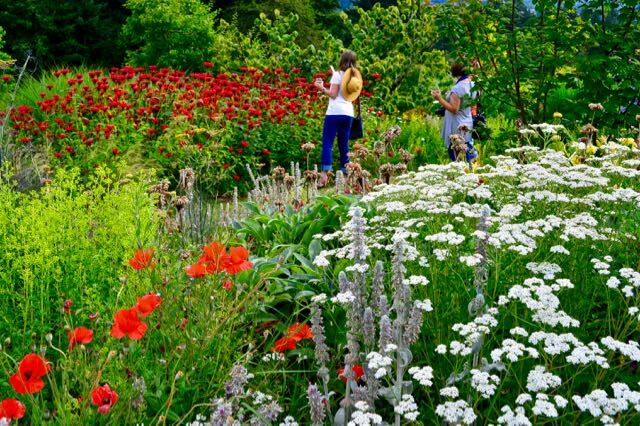 Revisiting this shot of Wouterina DeRaad’s garden (lower left) I said, you guessed it: Oh. Oh! There’s yarrow! The yarrow-blinders have fallen from my eyes! 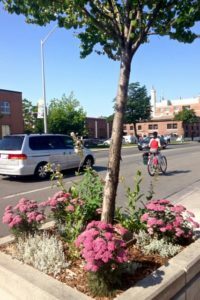 This year, I even noticed my local Business Improvement Association had swapped the traditional annual baskets on street tree planters for hardy perennials like you-know-what. Yarrow looking lacy in Wouterina’s garden. 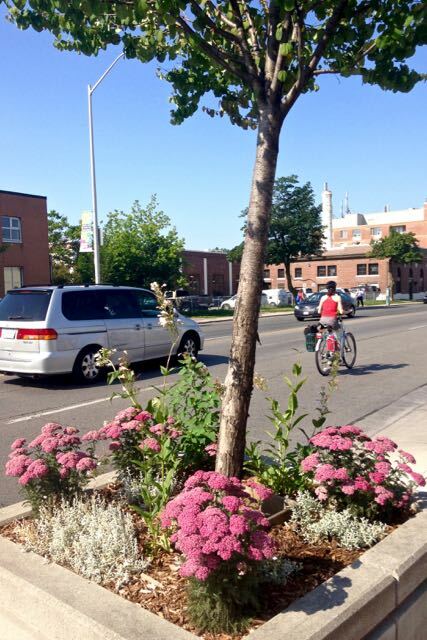 Tree planters on Danforth Ave. go drought-tolerant. 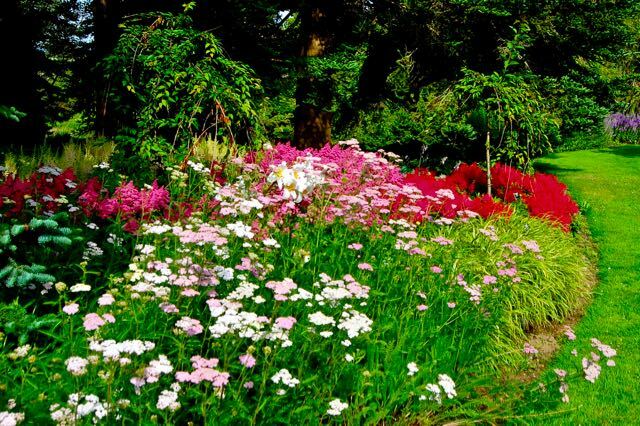 Mass of “mini daisies” make the flowers attractive to pollinators. I wonder who deadheads these? Wild yarrow on the Leslie Street Spit. 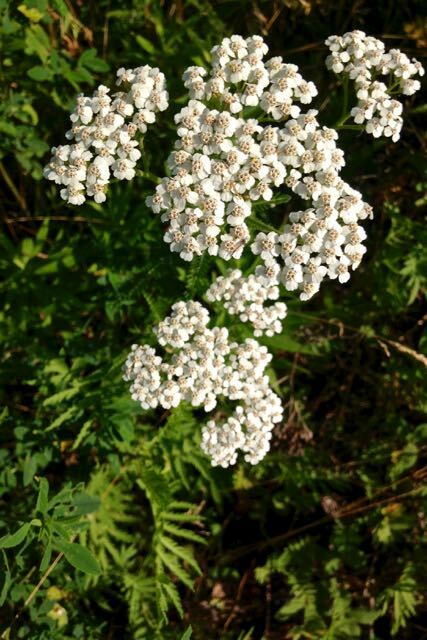 In our local parkette, the yarrow below is pinkest when it first opens, maturing to white. It gets a bit of afternoon shade, so stretches by late July as it reaches for more light. But it was compact when this was taken a few weeks ago. Millefolium, meaning “thousand leaves,” comes from the look of the greyish, fern-like foliage. 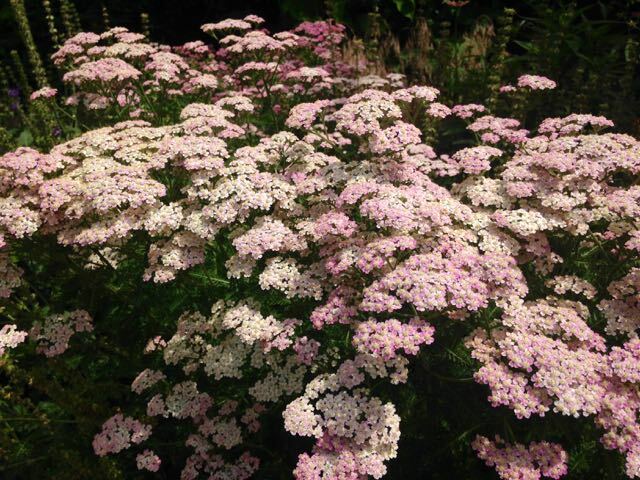 One pink-and-white yarrow cultivar is ‘Island Pink’ (but I’ve no idea if this is she). 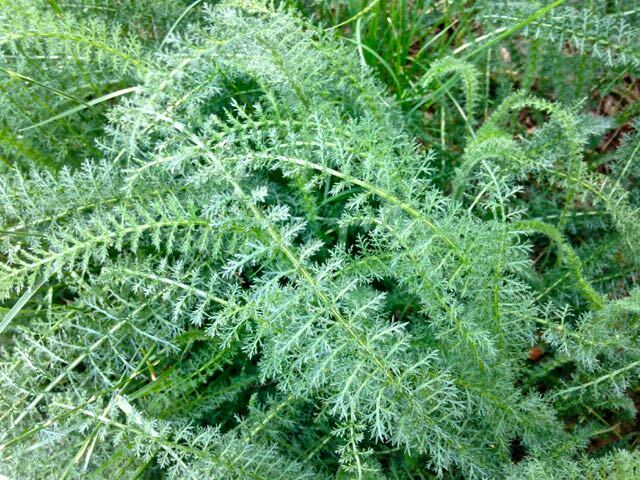 Softy, lacy Achillea millefolium foliage. Not all yarrows are shy and retiring. 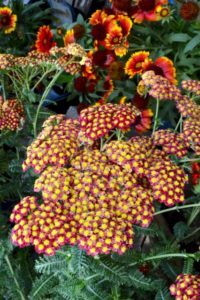 One of the showier forms is tall, sturdy, yellow Achillea x ‘Moonshine’. 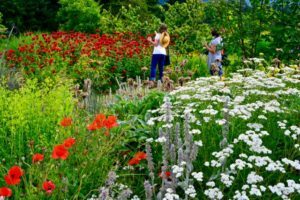 Deadheading can encourage more blooms in all yarrows. But this one also makes a good show if left to dry at the end of the season. The photo below was taken in September at the Phipps Conservatory in Pittsburgh. 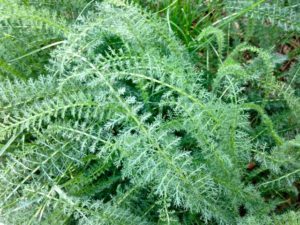 What do you think about yarrow? If you use it (or hate it) tell us how (or why). We love to hear about our readers’ experiences. 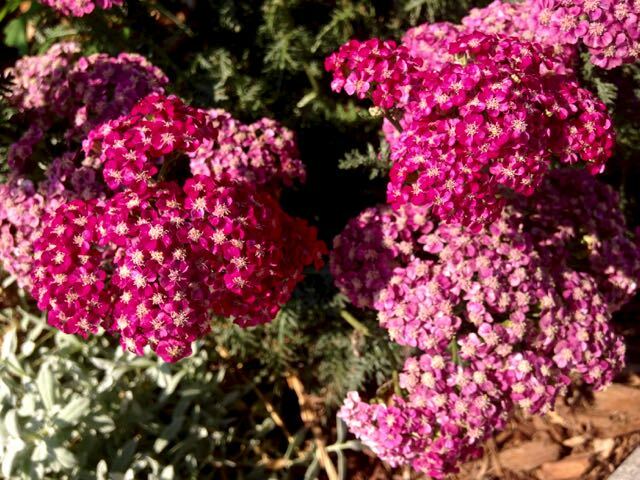 I love the pink yarrow — I think I missed it, but the color echo, as you write — is wonderful. 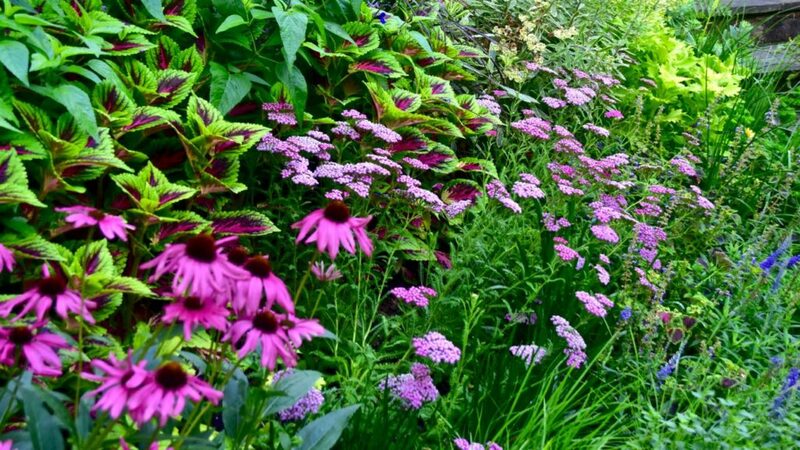 The tough perennials are what I look for! I don’t actually have any in my garden now that I’m thinking about it. 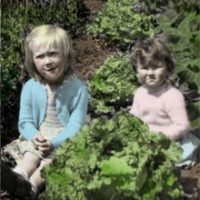 Looking at the last pics of your garden on your blog, Lisa, I think you might have a spot here or there for some. 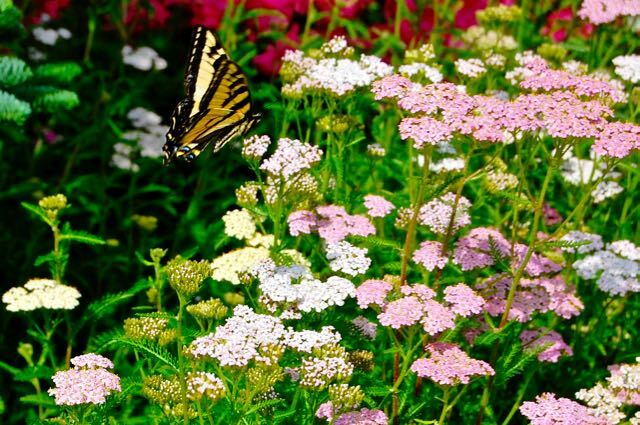 I have always loved yarrow as it is so showy, does well in hot, sunny, dry locations and doesn’t really need much attention. Now that I’ve retired to a hot, dry area in the BC mountains, I’m finding it even likes my gravelly soil! What a plant! So far. I have 5 varieties in the garden, with one more on its way. Soon they should provide babies to use for providing swathes of colour. Wonderful, Gordon! I’ll bet you get some happy butterflies. They really love those flat-topped Compositae flowers. In UK they seem to be shortlived. Do other plants that prefer conditions on the lean, dry side behave the same way, Anne? I also find that heavy-blooming perennials can be short lived. Gaillardia comes to mind. I like yarrow but not so much the wild yarrow that is spreading in my lawn. I don’t mind it in the grass, in fact I quite like it, but the problem is that it’s runners are going everywhere, including the beds – even raised beds – and if I don’t watch it, it takes over a spot in no time.